Oddly enough, I never drank a single Manhattan during the 13 years that I lived in Manhattan. I wasn't much of a cocktail connoisseur back then, and I didn't come to appreciate the Manhattan—one of a handful of true classic libations in the cocktail canon—until I moved to Utah, of all places. If you know anything about the history of the Manhattan cocktail, it's probably wrong. The story that's been passed on through generations has it that the Manhattan was created at New York City's Manhattan Club in 1874, where it was invented by a Dr. Iain Marshall for a banquet attended by Lady Randolph Churchill, mother of Winston. Perhaps the Manhattan was given birth at the Manhattan Club, but it certainly wasn't created in honor of Lady Churchill, who at the time was pregnant in France, and due shortly to give birth to little Winston. Other accounts suggest that a bartender named Black, who ran a joint a just south of Houston Street in Manhattan, concocted the cocktail as an homage to his beloved borough. 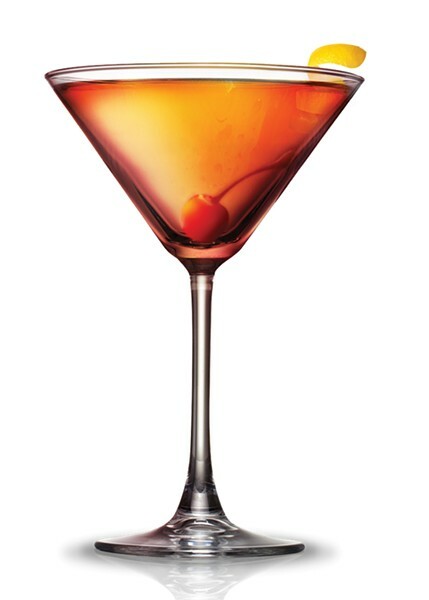 Regardless of its origins, the Manhattan is about as perfect as a cocktail gets, in part because of its simplicity. The bare bones of a classic Manhattan are nothing more than whiskey, sweet vermouth and bitters. It's extremely easy to make, requiring no special tools or gadgets. It's totally satisfying any time of the year. But it seems especially suited to the holiday season. Maybe that's due to the drink's festive red-orange hue. Although early Manhattans were made using straight rye—the 19th-century spirit of choice—today, bourbon whiskey is thoroughly acceptable. The other main ingredient is sweet vermouth, and boozy historians claim that the Manhattan was one of the first cocktails to utilize that aromatic aparitif, predating other classic vermouth drinks like the martini and the Rob Roy. When you're assembling a cocktail as stripped down as the Manhattan, top-quality ingredients are of the utmost, so don't skimp. I like to break out my Henry DuYore's rye whiskey (named for the legendary moonshiner) when making Manhattans, because it is so well-balanced. The distiller, Tad Seestedt, says of his Henry DuYore's: "With this Rye Whiskey, we sought to temper the admirable innate feistiness of rye with the rich, supple flavor of malted barley." Hence, the grain bill for Henry DuYore's rye whiskey is roughly 78 percent rye and 22 percent barley. Sweet vermouth is an integral Manhattan ingredient, too. Don't even think of using cheap vermouth; buy the real stuff. I like Ransom sweet vermouth, which is barrel-aged in French oak. I'm a traditionalist, so I turn to classic bitters like Angostura. However, feel free to experiment: There are some fine regional bitters, including some made in Utah. Maraschino cherries are an optional garnish that I enjoy. However, don't let those florescent-red Maraschinos from the supermarket come anywhere near your Manhattan! Be sure to use real Maraschinos, or quality Maraschino liqueur such as Luxardo. Manhattans are usually served cold (stirred, not shaken), but feel free to enjoy yours on the rocks or perhaps with a single ball of ice. This classic drink's festive red-orange hue makes it perfect for the holiday season. Rub the rim of a martini or rocks glass with orange peel. In a cocktail shaker with ice, add the rye, vermouth and bitters. Stir gently and strain into the glass. Add a Maraschino cherry or two and garnish with lemon or orange peel.